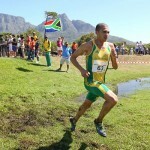 ‘I did not really go for the win, but I expected to finish in the top 5,’ the words of track athlete Elroy Gelant after he won the SA Cross Country Trials in Potchefstroom on 18 February 2012. Gelant beat some of the best athletes in the field including 2011 winner Kgosi Tsosane and old time favourite Steven Mokoka. The 12km for the senior men consisted of 6 laps on the 2km course and it was not until the fourth lap that Mbongeni Ngxazozo broke away from the main group with David Manja, Elroy Gelant and Lungisa Mdadelwa following. Somewhere in the next lap Gelant overtook Maja and lead the race to the finish line. Steven Mokoka started at the back of the pack and many expected him to come through and surprise with a finish in the top 10. Mokoka, who already qualified for the Olympic Marathon, ran the Best Med Tuks Half marathon in the morning and finished 18th, almost 2 minutes after Gelant came in. The Phalula twins dominated the senior women’s 8km trials from the very start of the race with Nolene Conrad in the front pack with them. Lebogang Phalula went into the last lap with a massive lead, almost 150m on her closest competitors and won the trials. According to Lebogang it was not a difficult race for her to win as she has been working hard on her fitness levels. Defending champion Lebo Phalula came third with Mpho Mabuza finishing 2nd, two weeks after running the SA Marathon Championships in George. Other familiar faces to come through in the top 10 were Nolene Conrad who finished 7th and Christine Kalmer in 10th place. The top 3 of the junior men’s trials was not decided until the last lap where Tunisang Monnatlala took the lead. The last 300-400m however caused a lot of excitement as it was a sprint finish between Monnatlala and Sello Masia. Sello Mokwena finished 3rd, also just after Masia. There were about 7 seconds between the top 3 athletes in the junior men’s category. Sylvia Tshehtlanyane won the junior women’s title with Anylsee van Graan crossing the line 2nd. Third place went to Luleka Dyonki from Central North West. Anylsee’s sister Kyla finished 4th. The top 4 athletes (seniors and juniors) have a guaranteed spot in the team for the Africa Cross Country Championships taking place on 18 March in Cape Town, with the same rules applying to the Southern region Cross Country Championships in Mauritius (3 March) where the seniors will compete.